Driving a box truck disguised as a giant camera, Agnès Varda and Jean “JR” René tour the French countryside in Faces Places, visiting farms, coal towns, factories, tiny cemeteries, and a toppled German bunker that sits like a Brutalist monument on a Norman beach. The odd couple pairing is almost too cute: the arthouse icon and the rising artist who could be her grandson. But Varda has always had a gift for extracting wisdom from apparent whimsy. Her films—whether fictional character studies like Cleo From 5 To 7 and Vagabond or documentaries like Daguerréotypes and The Gleaners And I—are driven by a curiosity that her male peers in the French New Wave never shared. In that influential movement, she stood apart not only as the sole woman in what was otherwise a boys’ club, but as the one director whose work didn’t scream that she’d rather be living in a movie. And yet no other New Wave filmmaker ended up devoting as much of their creativity to documenting their own surroundings and friends. Interesting how that goes. On Faces Places, she shares the directing credit with the thirtysomething JR, who is known for wheat-pasting larger-than-life portraits on the sides of public buildings. There’s a practical reason for this creative decision: Though she could pass for someone two decades younger, Varda turned 89 earlier this year, and her eyesight is failing. In one of the movie’s whimsical staged sequences, the May-late-December filmmaking duo employ a tilt-shift lens to replicate Varda’s badly distorted eyesight. In another, they rattle off the ways they might have met in a voice-over; cue a pan across as a nightclub, with the octogenarian Varda swaying on the crowded dance floor. Mortality—that business of being confronted with what you were and what you aren’t anymore on a daily basis—is funny, but it’s still mortality, and questions of death and the past keep drawing the fanciful cross-country trip back like a current. With a skillful camera crew in tow, the filmmakers lay flowers at the grave of the master photographer Henri Cartier-Bresson, drop in on JR’s grandmother, and even try to pay a visit to Varda’s last living contemporary, the elusive Jean-Luc Godard. Like Godard, JR never takes off his sunglasses; it’s the resemblance that keeps stirring up memories of Varda’s lost friendship with the brilliant director, leading to a trip to his home in Switzerland. But Godard comes off as a monumentally insensitive sphinx, as is his wont. Sometimes it’s better to just have memories—though, as JR opines, at least Godard’s enigmatic dickishness has given their movie some drama. 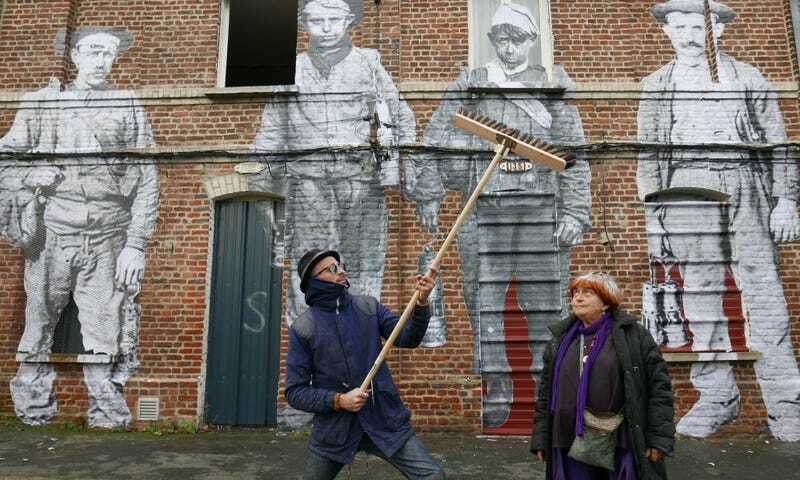 He’s not wrong; unfolding as a series of thrift-shop-find vignettes, Faces Places has oodles of charm and moments of beauty, but lacks the essayistic point-of-view of Varda’s best documentaries. Creating wall-sized portraits of locals as they travel from town to town, the two inquisitive, kindred-spirit directors peer into the day-to-day life of rural and working-class France, the camera listening and learning as old and middle-aged villagers remember how coal miners used to bathe and eat back in the day or goat-cheese makers give their differing opinions on the subject of dehorning. As the cliché goes, the journey is the destination.